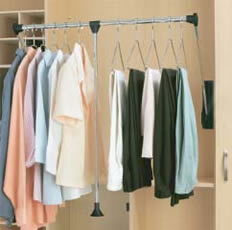 Pull-Down Closet Rod. Features an adjustable rod length to accomodate openings from 26" to 35" (Part # RCPDR-2635) and 35" to 48" (Part # RCPDR-3548). Both sizes come with a telescoping pull-rod. Now your pull rod can be the length that works best for you. It is adjustable from 34" to 50" to accomodate universal design and handicap accessible applications. Note: RCPDR-3548 is not recommended for applications wider than 36". Keep dirty clothes from piling up on the floor with this Double Wire Pull-Out Hamper. Designed for 24" W x 14" D closet systems.